Since 1909, many students have chosen to be involved in Greek life at the University of Redlands. Being Greek at our school comes with expectations—10 community service hours minimum per semester and at least a 2.5 GPA—and the goal of achieving our pillars: academic success, community service, leadership, tradition, and alumni relations. For students who want to participate in Greek life, rush—which finished last week—is the matchmaking period when students and fraternities or sororities find a good fit. As the Panhellenic president, my goal is to make sure the whole process goes smoothly. Rush begins on the first Friday of the semester, with an event called Mandatory Q&A. Dozens of girls walk into a room, not really sure what to expect, as members of the Panhellenic leadership—this year, Panhellenic Vice President Kate Fox ’20 and I—launch into an informational session, reviewing the rush rules and eligibility for Greek life. To rush, students must be enrolled in at least 12 credits, have a 2.5 GPA minimum, and have sophomore standing. When the session ends, the rushees take off excited for the next step in the process: Informals. 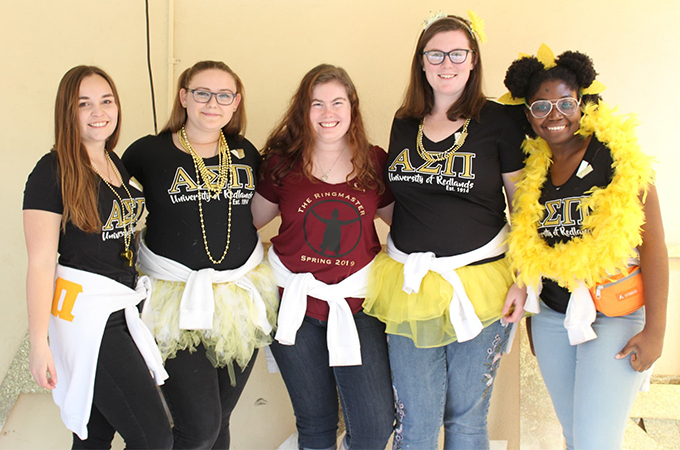 All seven sororities—Alpha Chi Delta, Alpha Sigma Pi, Alpha Theta Phi, Alpha Xi Omicron, Beta Lamda, Delta Kappa Psi, and Kappa Pi Zeta—hold a mandatory Informal, which provides rushes with an opportunity to get to know the sorority members and organizations in a fun and welcoming environment. You can’t imagine the food at Informals until you experience it first-hand! Each sorority has its own private room filled with towers of snacks. The tables are covered with lollipops, cookies, and pieces of chocolate—with an abundance of fruit punch and finger sandwiches. In addition to snacks, these sessions can include craft stations, socializing areas, and photo booths. Following Informals, rushees can choose to attend casual mixers to get to know the sororities a bit better. I always recommend rushees attend as many of the events as they can to get a better sense of what it means to be Greek and see which groups feel like a fit. After a week-long round of mixers, sororities begin to send out invitations for the next round: Formals. Formals are the first invitation-only event. Gummy bears and cupcakes are traded for finger sandwiches and tea, and the rushees exchange their old Converses for wedges and flats. While the sophomores eagerly await their invitations, this is also their first chance to reject events. The rush process is not one sided—organizations are trying to impress rushees just as much as vice versa. After Formal weekend, Date Week begins. During this period, individual members of each organization ask out rushees in an attempt to get to know them better. This week leads up to the final rush event, Open House, the second invitation-only event. Rushees have two hours to attend the Open Houses of the organizations that interest them. Once time is up, they flock over to the School of Education for Preferencing, where rushees rank their sorority preferences. Rankings can include just one to all seven (if they attended all the Open House events). At that point, Greek leadership and the Rush advisor, who is Director of Student Involvement and Success Erin Sanborn, can begin matching individuals with sororities, so the matches can be shared on Bid Day, the final day of the rush process. On Bid Day, I arrive in Hall of Letters 100 with Kate, Erin, and Greek intern Mia Connoly ’19 at 6 a.m. to start the day, which for organizers involves cross-checking rush event attendance, corresponding with each sorority president, reaching out to all rushees with questions, and making sure each student is matched to a bid (an offer to join a sorority). Once the proceedings started, it was hard to hear anything as Mamma Mia 2 played in the background, a small attempt to de-stress the students waiting to receive the news. Kate and I took turns calling rushees into our room to hand them sealed envelopes with bids inside. Many girls screamed. Some cried. It was an emotional time for everyone. In the end, 63 students are placed in their new organization, and each sorority is thrilled to have them. I hope all new members find the same level of support and sense of belonging I did with my sorority. Learn more about Greek life at the University of Redlands.